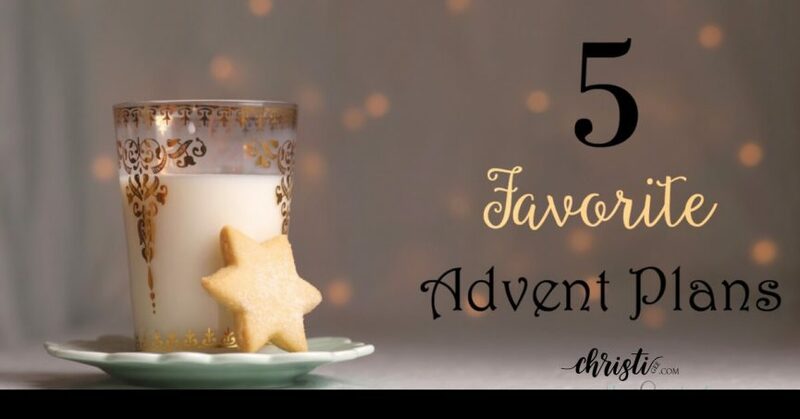 With so many Advent options, you might feel a little overwhelmed at all the choices. My daughter (Makenna, of She Sees Truth) is an Advent junkie. For years I’ve watched her juggle 8-9 Advent resources at a time. She LOVES this season. So, a few years ago we began reviewing our top five in this post. It is updated each Christmas to reflect the most recent finds or continue to showcase long-time favorites. This year, we’ve added our own Advent resource! We looked for options that weren’t overly complicated and would serve those who were simply looking for help focusing their heart or leading their children. I love The Bible Project and their presentation of Scriptural themes and books of the Bible. The format is engaging, informative, and biblically sound. Although this series is billed as being for churches, the focus is great for individuals or even families with older children. If you are on staff at a church, DO check it out and see what all they offer to help you advertise your Advent. Also see their videos on Luke and the Messiah series. Both of these are great for ALL ages, and if I were still leading children’s ministry I would use them for sure! 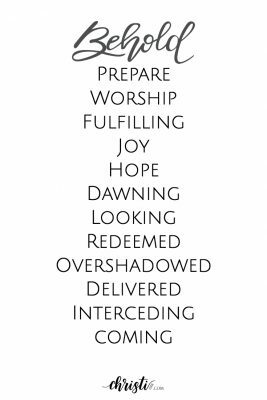 • Focus (Sermons): 30+ to choose from on Birth of Christ, Prophecy, Waiting, etc. 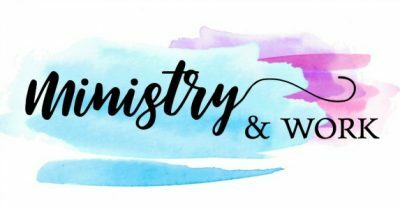 “This guide contains five weeks of material, with both a study to complete on your own as well as a plan to help families talk about the Advent narrative together. The family portions are designed to work for families of all shapes and sizes and do not require extensive preparation. Either portion of the guide can also be used to facilitate discussion within your Home Group or with friends, roommates or other community. The Advent study walks through the narrative of Jesus’ birth. It begins in the Garden with God’s promise of a Savior and ends with an eager anticipation of Jesus’ promised return. In the middle, God shows His unmistakable faithfulness in sending the promised Rescuer. We see His love for the lowly and outcast as He proclaims the news of His Son to the shepherds. This is one of the most comprehensive resources I’ve seen. I love that the guide offers both personal reflection and family time ideas. As for the sermons, I have listened to almost half of them. Matt Chandler is a gifted communicator. 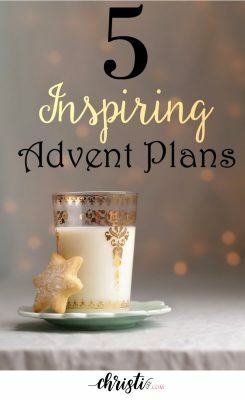 I included some of my favorites on our 24-day plan that incorporates my Advent devotional, outreach activities, and favorite sermons. You’ll find links to those sermons in that online schedule here. This is a deep resource for individual reflection. This mom also painted clothespins to represent each character and uses them alongside each reading. She mentions her children love searching for the right character each day and adding it to the display stand while she reads the story. I have always taught the Bible chronologically to children and there are 20-somethings out there now who tell me it made a big difference in their understanding of the stories as ONE story. One of the churches we ministered with put up a “Jesse tree” and taught about the lineage of Jesus in the weeks leading up to Christmas. It was always a favorite time for the children. This resource highlights Jesus as the Savior of ALL sinners and introduces children to Bible characters in time and space. Activity: Find photos of grandparents, great-grandparents or other distant relatives. Talk about things that have been passed down to your children: beliefs, interests, talents, heirlooms. Discuss how family names are passed down, too. Lesson: Jesus was called the “Son of David” not because His dad’s name was David but because His ancestor was King David, a special king whom God had chosen to rule over Israel. God had said that the Savior of the world would come from David’s family line. And that Savior is Jesus! Especially with younger children, introducing a concept with an object lesson can be a powerful way to both get their attention and make a memory. This resource — although not chronological — includes a wonderful set of activities that set the children up to absorb a foundational truth about Christ. This is the 2012 version of Thriving Family’s Advent. We were not impressed with the recent years’ products, as they seem to be a lot of busy work for the parent with less deep truth for the children. However, by signing up for THIS year’s (2017) free resource here, you will be directed to a page with access to most of the previous years’ downloads. It’s a great library to peruse, and if you’re into the crafty-cut-and-paste, etc. then they definitely have some resources for you to consider. and inspired by favorite lines from treasured Christmas hymns. and a 24-day plan that adds Scripture readings, sermons, and outreach activities to the book’s devotions. It’s about choosing to develop a mind full of wonder, a heart overflowing with expectation, and a soul ready to embrace Christ: newborn baby, crucified Savior, and coming King. However you do that, you will be blessed.